NEW BRUNSWICK, N.J. – New Jersey has an abundance of picturesque horse farms with rolling green pastures and well-managed grounds. Three years ago, a joint project between the New Jersey Agricultural Experiment Station at Rutgers University (NJAES), the Rutgers Equine Science Center, and the New Jersey Department of Agriculture (NJDA) called the New Jersey Equine Environmental Stewardship Program sought to recognize these farms with an award that can be displayed by the roadside. The award is called the Gold Medal Horse Farm award. The award and overall program gives recognition to outstanding equine farms for their dedication to environmental sustainability and management. It also underscores the efforts of the New Jersey equine industry to maintain the beauty of the Garden State. The 2015 winner of the Gold Medal Horse Farm award is Lord Stirling Stable, part of the Somerset County Parks Commission System, located in Basking Ridge. Established in 1968, Lord Stirling is located on the site of the former John Jacob Aster estate within the Great Swamp Watershed. Home to 80 horses and ponies, Lord Stirling Stable serves the recreational equestrian needs of Somerset County residents and other nearby counties. A large effort has been made by staff and management to increase natural resource conservation awareness through implementation of environmentally-friendly equine best management practices. Lord Stirling Stable was given the award from the Equine Science Center at Rutgers University during its annual “Evening of Science & Celebration” on November 12th, 2015. 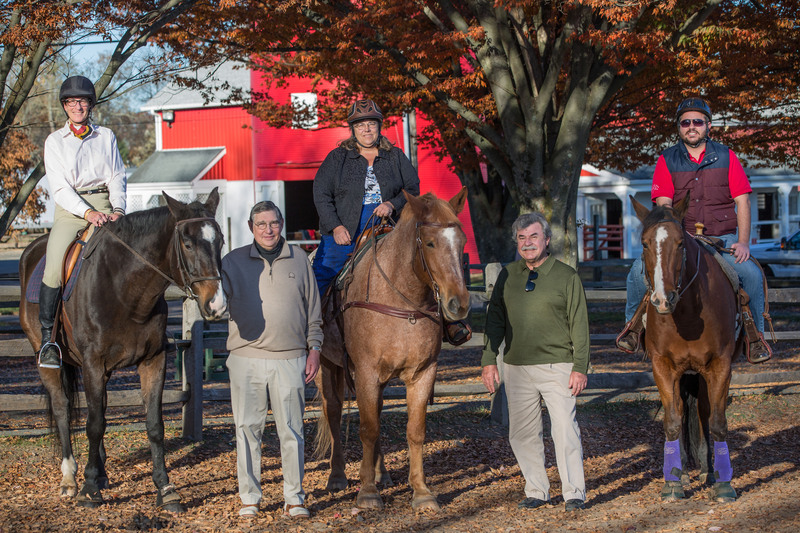 Rutgers Equine Science Center staff enjoying a beautiful fall day, with friends, at Lord Stirling Stable. Pictured left to right: Dr. Karyn Malinowski, Director of the Equine Science Center at Rutgers University; Bob Mulcahy, Trustee of the Somerset County Park Foundation; Margie Margentino, Manager of Lord Stirling Stable; Ray Brown, Director of the Somerset County Park Commission; and Kyle Hartmann, Public Relations Specialist of the Equine Science Center at Rutgers University. In the fall of 2013, a new Nutrient Management plan was developed that benefits not only the stable, but also the entire Park System. The new plan incorporates an on-site composting facility where manure and bedding waste generated at the stable is composted. The end product of nutrient rich compost is used as organic fertilizer on the stable’s pastures and trails and also as soil enrichment material at other Somerset County Park locations. Other management practices modified or newly incorporated include: non-chemical control of weeds, dragging pastures to break up manure, pasture renovation, and hand-removal of manure from smaller paddocks and turnouts. Lord Stirling Stable is home to more than 50 species of birds, including bobolinks and bald eagles, which nest along the nearby Passaic River. Numerous wildlife species call the stable and pastures home; including raccoons, opossums, skunks, groundhogs, fox, and deer. Applications are due by June 15, 2016.